My son loves tracing pictures. He will often stick a colouring page up on one of the sliding doors, stick a piece of paper over and trace the picture. Now I know tracing is NOT the same as drawing, it is not a picture that he drew but I have always maintained that tracing a picture does “teach” him a lot. He gets familiar with the shape of different items, the way the lines curve and join together, even how objects are bigger closer and smaller further away (yes he actually commented on that once while he was tracing a picture) and he often chats about what he is tracing – “Mom this must be a blue shark because it is ………..” or “Mom look I can tell this is a whale because of its tail.” He has a tendency to chat away when he is happy so it is always a good indication that he is enjoying a task when he starts chatting and telling me facts. But most importantly for me tracing an object, any object gives him confidence, confidence that the object he just traced is not that hard and that he could probably draw it himself. This past week he asked me for Shark colouring pages that he could trace. He wanted a whole bunch of different sharks. 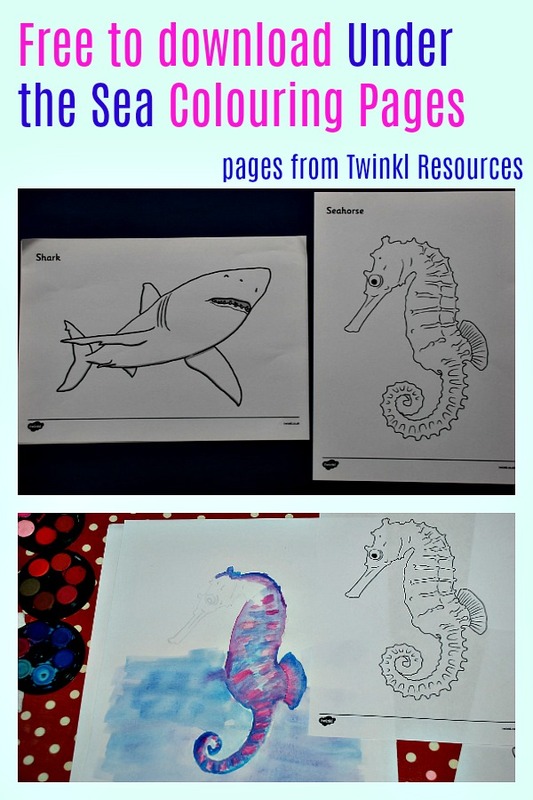 I found this pack – Sharks colouring pages on Twinkl (part of their paid for subscription) and I also found an extra shark page included in their FREE to download Under the Sea colouring sheet set. And he was set. And a few days later he decided it was time to draw his own. In his first few attempts he kept making the shark’s body too straight and the fins too thin and long so he went back to his wall and took all the original colouring pages down and started drawing by looking at the pictures, sometimes even retracing the way the lines curved with his fingers. Slowly each shark he tried improved. So yes I know tracing over pictures might seem like the easy way out but sometimes what seems easy actually builds confidence and leads to so much more. 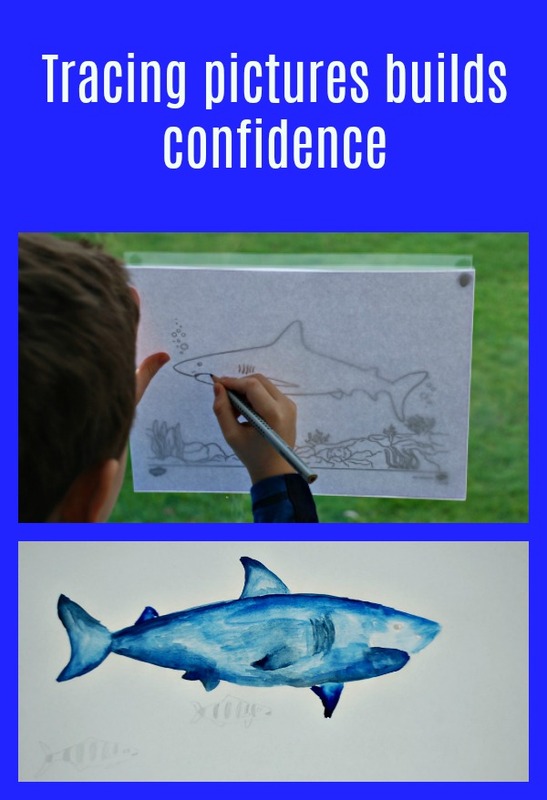 This entry was posted in Art and Craft Ideas and tagged children's art, free printables, home ed, home education, homeschooling, sharks, Twinkl. Bookmark the permalink. That’s a great process! What an interesting study in how your boy learns, and what beautiful final products!! Thanks I do love his sharks that he has created. I must admit I love watching how the kids learn, they have taught me a lot. This is fantastic! I love the results of the watercolors, too. My mother was once a commercial artist and I remember her light table. I loved using it to trace. oh light tables are amazing. It was a cool table. My grandpa designed and made it for her.